Personalized Vintage Car Garage Plaque - - wall mount personalized garage plaque contains a stunning vintage car right in the middle above the word GARAGE in stylized print. One line of personalization at the top and the established year at the bottom. Made in USA. Line 1 holds ten 1.25" characters (including spaces and punctuation). Line 2 comes standard with EST. followed by the year you specify displayed as four 1.25" numbers. Color combinations: black with gold characters; antique copper; pewter with silver characters; bronze with gold characters. Dimensions: 11.5" diameter x 0.25". 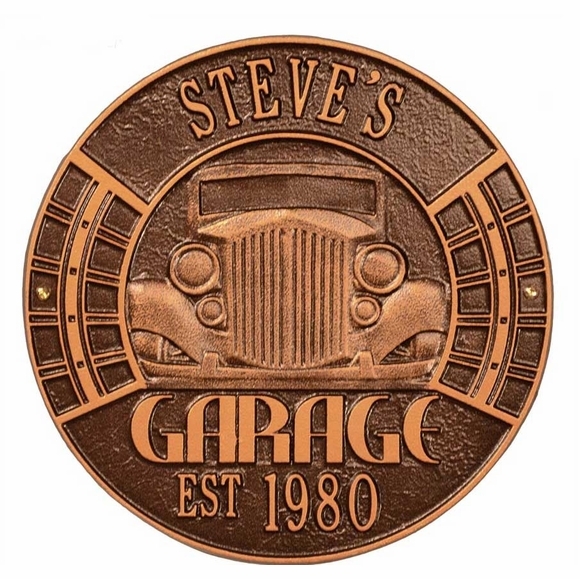 This vintage car plaque is the perfect finishing touch for a classic garage. Personalized with name and established date.